Nero Burning ROM is professional disc creating and burning software that can burn Blu-ray discs, HD video DVDs, data or audio CDs with simple and easy steps. It lets you burn anything including music, videos, data, images or documents. The speed and accuracy of Nero products is awesome and every professional computer user should know about it. Nero burning ROM is working since 1998 and now it was ranked as most powerful CD, DVD and Blu-ray disc burning software. Dragging & dropping anytype of file into new disc data and it will shows a bar that contains size information. Whenever, user select CD or DVD type, it shows red bar after achieving target size for selected disc. You can simply choose CD-ROM Boot, ISO, UDF and SecureDisc under CD burning. Nero Burning ROM gives maximum writing speed after getting hardware information about disc writer attached with system. SecureDisc lets you put password to CD for adding immediately lock to personal files or important information. Nero has multiple products where most of them are related to movie, video and disc burning. Nero developer team has wide experience in this field of work because they already developed bundle of products. The addition powerful features are erase disc, rip audio disc and make file conversion as well. Nero is not only for advanced and professional users but a beginner can burn anytype of disc with its simpler methods. 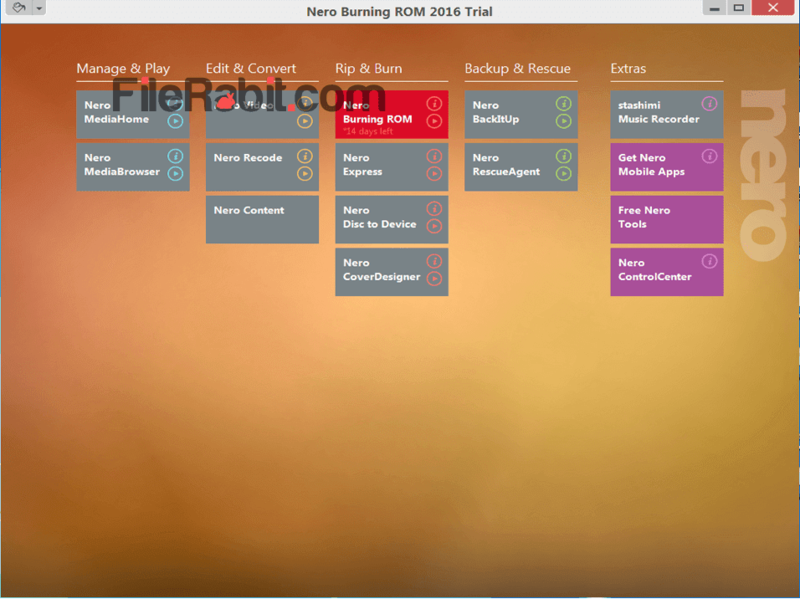 Nero Platinum is an advanced feature multimedia management software which offers dozens of ripping, mixing, conversion and burning features comparing to Nero Burning ROM. Just you can copy, rip, protect and burn personal information about audio, video, pictures and other database files. The multimedia files will include subtitle, title, band names and other information. Direct 3D 10.1 and Microsoft VC Redist will be installed in setup. RIP Disc: Ripping audio CDs with addition of automatic file conversion and basic information mentioning. It supports MP3, ACC, FLAC and APE audio file extensions. The relevant audio file information will be added into CD/DVD e.g. bands, song titles, genre. 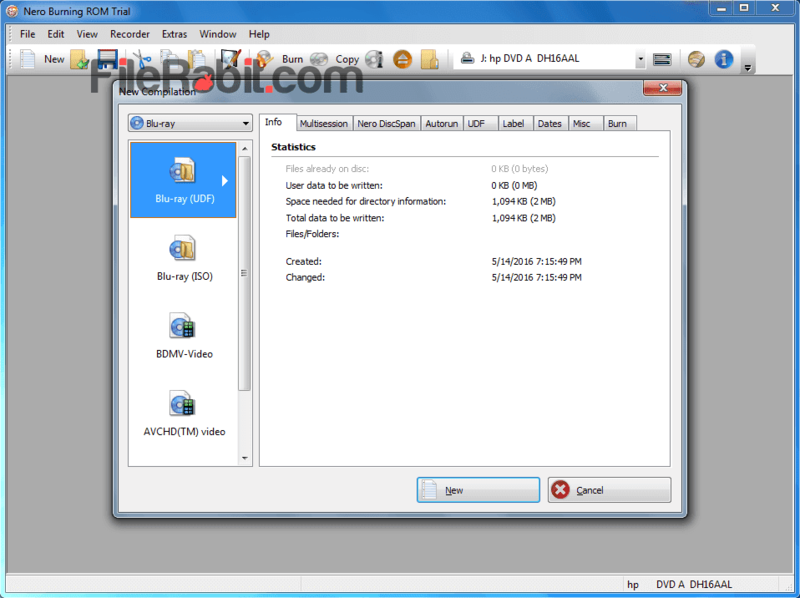 Copy Disc: Copying music, video clips, camera images or document files from one disc to another. The copying speed is extremely high and automatically set to maximum level. Protect Disc: SecurDisc is latest technology used to secure data in CDs, DVDs and Blu-ray discs. It will draw a digital signature into disc that will show your copyright ownership electronically. Burn Disc: Burn wedding movies, picnic or birthday videos, image gallery of HD camera, office documents or anything with Nero Burning ROM. It gives ultimate collection of tools to burn data right from tablet, mobile phone or PC.